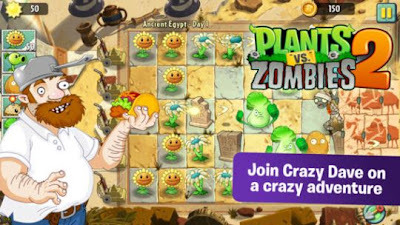 Plants vs Zombies is a popular action strategy video game developed by PopCap Games. They released a latest version of Plants vs Zombies 2 for Android devices in Australia and New Zealand last week. Now this game is available for all Android users globally. This is a sequel of first Plants vs Zombies game and you can play this game free in your tablets and smartphones. Plants vs Zombies 2 game lets you join Crazy Dave on a crazy adventure where you’ll meet, greet and defeat legions of zombies from the dawn of time to the end of days. You have to destroy the zombies with an army of powerful new plants, supercharge them with Plant Food and power up your defenses with amazing new ways to protect your brain.